A Star Is Born: Is it worth the hype? A Star Is Born, directed by Bradley Cooper and Lady Gaga’s first leading role in a major motion picture, was released in the UK on October 3. Here is everything you need to know. Bradley Cooper, Oscar nominee, producer and actor, makes his directorial debut with a remake of A Star is Born. The original film, first released in 1937, is about an aspiring actress who reached fame through the help of an alcoholic actor. In 1954 it became a musical and was then remade again in 1976, and this time the spotlight is on a reckless rock star who falls in love with a singer on the rise. In 2018, Cooper transforms the “Hollywood classic” into a modern, musical love story. As well as directing, he is also the leading role in the film, portraying Jackson Maine, a successful musician alongside Stefani Germanotta, known as Lady Gaga, who plays a struggling artist named Ally. The plot follows Ally, who is one step away from giving up on her dreams of becoming a singer. Jackson, a successful musician with destructive addictions, discovers her talent. He manages to help her professionally and they quickly fall in love. Throughout the movie we see Ally become a successful artist while Jackson’s problems get in the way of their romantic relationship and his own career. During the film Cooper unveiled his singing voice to the world. He also wrote an original soundtrack alongside Gaga, rock-country singer Lukas Nelson and producer Mark Ronson. The soundtrack was recorded live during filming. It features the song from the first trailer, ‘The Shallow’, sung by Gaga and Cooper, which has a way of transporting you into another reality. 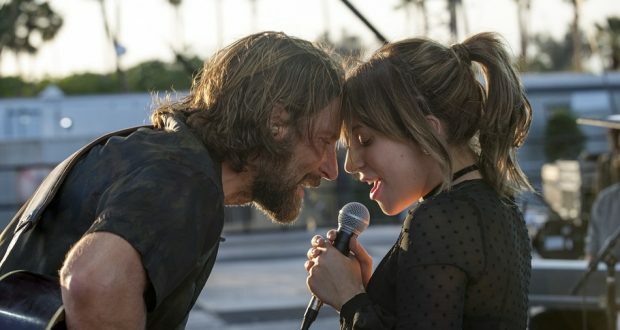 A Star Is Born was mainly filmed in California, but some scenes took place at Glastonbury Festival. Cooper mentioned in an interview that he wanted to bring to the big screen the perspective of the artists. Usually, the more popular scenes are the ones filmed from the crowd’s perspective, but Cooper’s alternative offered the film an intimate feel as if you were a part of the characters’ journey. Each scene flowed, one after another, with striking imagery carefully chosen to fit the overall aesthetic of the film. Cooper said at the Warner Bros. Pictures London premiere in Leicester Square that he wanted to make a movie that “examines love, what happens when two people really love each other”. The film examines love, indeed, but it also underlines the lows of addiction and the pressure alcohol and drugs stomp on a relationship. Cooper proved once again his ability to bring a character to life through his awe-inspiring performance. A Star Is Born reflects the raw reality of life, brings childhood trauma into discussion, and sheds light on the hardship of finding your voice, all through music. Gaga said, at the London premiere, that her character “feels bullied by the music industry, she feels like she is not pretty enough… she feels like she can’t sing her own songs”. She later went on to say how different her character is compared to her. Gaga’s chameleonic persona made her transition from pop-star to actress feel effortless. She delivered a natural performance and is fully immersed in her character. The movie also features Sam Elliott as Bobby Maine, Jackson’s older brother and manager and Dave Chappelle as Noodles, Jackson’s friend and a retired musician. Anthony Ramos makes an appearance as Ramon, Ally’s best friend, while Andrew Dice Clay plays Ally’s father, each character adding personality and uniqueness to the film. is A Star Is Born worth the hype? Simply put, yes, it is. Cooper’s both acting and singing, flawless performances combined with his natural directorial skills and Gaga’s fresh allure and astonishing voice make the film worth the watch.